Some time ago I preached a series called Storm Chasers. I wanted to try to help people stop getting beat up by the storms of life and the enemy that keeps coming after them. Personally, I am ready to turn the tables on the bad stuff- to reverse the curse and start chasing the evil out of my life. I have always wanted to be a storm chaser, in fact while I lived in Tulsa, my storm videos were often featured on the news. I would head into the the area where the storm was to capture the best images possible.Watching the habits and actions of a storm chaser, I realized that there are some characteristics they possess that we all need. 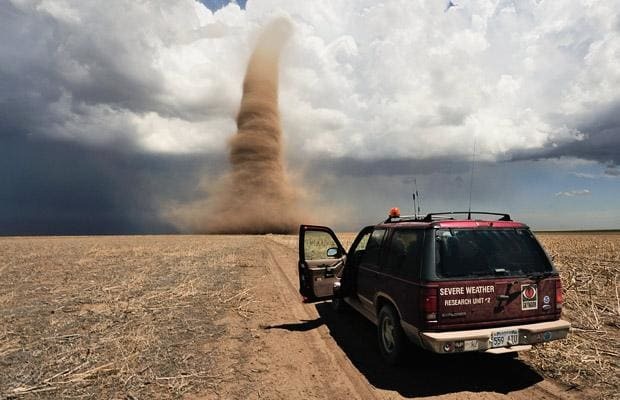 Let me share four things you find in the DNA of a Storm Chaser. When everyone else takes cover, they take off after the eye of the storm! They run into the battle and not away from it. They eat, sleep and breathe storms. They are consumed by the activity and details of each storm and hunger for more understanding. They are a select group of people that go crazy when Mother Nature goes crazy! They pursue until its through. They keep going until the funnel returns to the clouds...until the waters subside...until the shaking is over. Why is being a storm chaser in life so important? Because you are either going into a storm, in the middle of one, or coming out of one. Isn't it time you chased things like debt, depression and disease away? Next time you hear the siren because your life is being attacked, get your Bible and start speaking words of faith. At the end of every storm you just might see a rainbow!